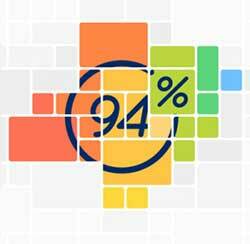 Walkthrough of 94% Something You Use Every Day Answers for every question in 94 percent game cheats. If I say wind instruments and show you a picture of factory, what comes to mind first? think some words that words associated with questions that will cover 94 percent of the given answers ! This is THE best game ever. I think I’m in love. I’m addicted to 94%. It’s like the love of my LIFE!!!!! omg on level 20 and just started today. First time cheating lol!! !